Nearly 9 in 10 (88%) marketers have increased their analytics efforts over the past 12 to 24 months, according to a new survey conducted by DemandGen Report. 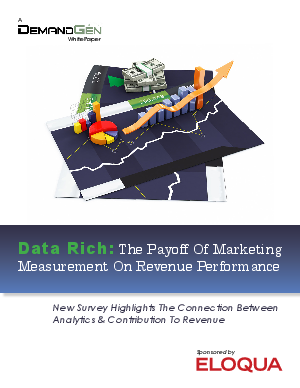 Download this report and find out how marketing's ability to track key performance indicators through better analytics is emerging as a path to greatly increase the ability to impact revenue performance. The disparity in revenue contribution between organizations with deep measurement capabilities and those without.